PANAMA, Republic of Panama — In Venezuela, the red siskin (Spinus cucullatus), a vibrantly colored red-and-black finch, is inextricably linked with the country’s identity. It is present in poems, paintings, names of streets and sports teams and even graces the back of the 100,000 Bolivar bill, but it is rare in its natural habitat. To help reverse this, the Smithsonian and the Piedra de Cachimbo coffee farmers in northern Venezuela stepped in. With support from the Neotropical Migratory Bird Conservation Act, farmers are committing to the conservation of 400 hectares of forest for traditional shade-grown organic coffee, seeking Smithsonian Bird Friendly certification of their beans. 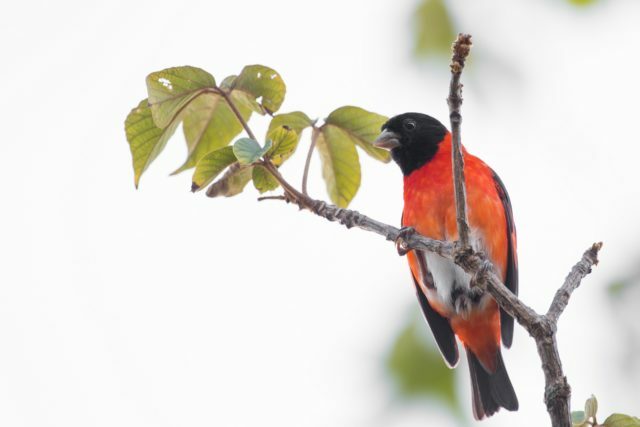 This approach is part of the Red Siskin Initiative (RSI), an international consortium in which the Smithsonian collaborates closely with Provita, a local NGO focused on the preservation of biodiversity in Venezuela, and other partners. This will protect the siskin’s natural habitat and increase their profits. As part of the process, they have established relationships with roasters and retailers in Caracas. Their plan, which will also protect other native birds and migrants, is embedded in the Smithsonian Conservation Commons, an action network within the Smithsonian highlighting the relevance of science and innovative interdisciplinary approaches to on-the-ground conservation. “Farm workers can help us monitor the birds, which is a big advantage. Some of these farms also border protected areas like national parks, creating a wildlife corridor,” said Brian Coyle, Conservation Commons program manager at the Smithsonian and RSI project coordinator. In addition to coffee, the project aims to include another agroforestry crop: cacao. The Bird Friendly certification standards for cacao are currently being developed by the Smithsonian’s Migratory Bird Center, which created the Bird Friendly program based on decades of scientific research. Currently, the RSI is producing a red siskin-branded chocolate bar made from organically sourced cacao. The profits go back to farmers, research and RSI conservation efforts. This initiative has also achieved a better understanding of illegal bird trafficking networks, which will allow for more focused preventive actions, based on research led by Ada Sanchez-Mercado at Provita and Kate Rodriguez-Clark at the Smithsonian’s National Zoological Park. One proposed solution is to supply enough captive-bred birds to fulfill the demand, an approach that proved effective with other bird species. For this, the RSI partners with private breeders in the United States and Australia who help figure out how to best breed the red siskin in captivity. Additional components of the RSI include genetics, animal husbandry, health and breeding research at the Smithsonian’s National Museum of Natural History, SCBI and the National Zoo.